LOS ANGELES – The San Jose Sharks concluded the 2010 NHL Entry Draft Saturday with Sharks Executive Vice President and General Manager Doug Wilson and Director of Scouting Tim Burke making seven selections in Rounds Two through Seven. After selecting right wing Charlie Coyle on Friday night in the first round (28th overall) on Day One of the draft, the Sharks made their next selection in the third round (88th overall) on Saturday morning, choosing right wing Max Gaede from Woodbury High School in Minnesota. He was ranked 104th by Central Scouting among all North American Skaters. Gaede posted 36 points (19 goals, 17 assists) and 36 penalty minutes in 25 games. The six-foot-two, 187-pound native of Maryland, Minn. also played in 11 games with Sioux City in the USHL, collecting two points (one goal, one assist) and two penalty minutes. He has committed collegiately to Minnesota State-Mankato but will play next season with Sioux City. San Jose held three picks in the fifth round and selected RW/C Cody Ferriero (127th) from Governor’s Academy (HS) in Mass., center Freddie Hamilton (129th) from Niagara of the Ontario Hockey League and defenseman Isaac MacLeod (136th) from Penticton. Ferriero, a five-foot-eleven, 190-pound center/right wing has committed to attend Boston College. He is the brother of Sharks prospect Benn Ferriero. Cody Ferriero had 40 points (21 goals, 19 assists) and 112 penalty minutes in 27 games and was ranked 117th by Central Scouting among all North American skaters. He was a member of the 2008 Select 17 U.S. squad. Hamilton, ranked 62nd by Central Scouting among North American skaters, is a six-foot-one, 187-pound center who played last season with Niagara in the Ontario Hockey League. He posted 55 points (25 goals, 30 assists) and 12 penalty minutes in 64 games. MacLeod, a six-foot-four, 205-pound defenseman was ranked as the 133rd North American skater by Central Scouting. He has spent last season with Penticton of the BCHL, where he posted 23 points (all assists) and 51 penalty minutes in 56 games. The Sharks acquired a sixth round selection (163rd overall) from the Calgary Flames in exchange for G Henrik Karlsson. With that selection, San Jose grabbed defenseman Konrad Abeltshauser from Halifax in the QMJHL. Abeltshauser, a six-foot-five, 190-pound native of Bad Tolz, Germany, posted 25 points (five goals, 20 assists) and 28 penalty minutes in 48 games. 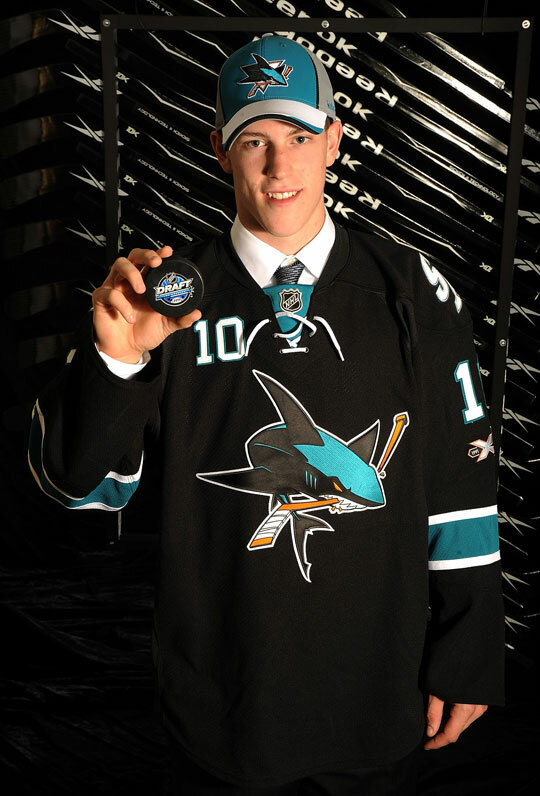 The Sharks also added a seventh round selection (200th overall) from the Pittsburgh Penguins in exchange for San Jose’s seventh round selection in the 2011 NHL Entry Draft. With their first selection in the seventh round (188th overall), the Sharks tabbed defenseman Lee Moffie from the University of Michigan. The six-foot-one, 200-pound native of Wallingford, Conn. played in 25 games as a freshman with Michigan, notching 12 points (four goals, eight assists) and 27 penalty minutes. With the 200th overall selection, San Jose added right wing Chris Crane from Green Bay of the USHL. Last season en route to helping Green Bay capture the Anderson Cup (USHL regular season championship) and the Clark Cup (playoff championship), he posted 29 points (15 goals, 14 assists) and 107 penalty minutes in 52 games. He was ranked 181st among North American skaters by Central Scouting. He has committed to attending Ohio State University. Follow the conversation on Twitter and Facebook.